India vs Kenya Football Highlights: India beat Kenya in the second Intercontinental Cup match on Monday with Sunil Chhetri scoring two goals. Captain Sunil Chhetri scored a brace in his 100th international appearance to lead India to a 3-0 win over Kenya in the second match of the Intercontinental Cup 2018. However, that was not before Kenya gave a tough fight in the first half. But it all changed in the second when the Indian skipper broke the deadlock in the 68th minute by scoring the first goal of the night from the penalty spot. Moments later, Jeje Lalpekhlua doubled the lead. Finally, in the added time, it was Chhetri who once again scored his second of the night to lead India to a memorable triumph. With this win, Indian already have one foot in the final after thrashing Chinese Taipei 5-0 in their first game. The final whistle blows and That's it, India win 3-0! What an evening it was for the men in blue. Sunil Chhetri's brace in his 100th game along with Jeje's pile driver helps the home team win their second match of the tournament. Led by Sandesh Jhingan the defence also held their nerves despite being pushed to the wall in the first half. As the entire country celebrates the occasion, Chhetri's takes his team for a lap honour around the stadium. That's it from all of us. GOAAAALLLL! Sunil Chhetri scores his second of the night. An exquisite finish by lobbing the ball over the keeper's head. India extends their lead. India 3-0 Kenya. Can India close this out! If India have to play well in big tournaments then it is imperative that they close down matches. This game will serve as a perfect platform for such dress rehearsals before the Asia Cup. Meanwhile, Anirudh Thapa is replaced by Rowllin Borges and Ashique Kuruniyan replaces Halicharan. John Makwata shoots from outside but India goalkeeper Gurpreet Singh Sandhu makes a fine save to keep his side's lead intact. India 2-0 Kenya. Defender Sandesh Jhingan is off the field with an injury. He was looking in some discomfot for some time now and is now limping. Narayan Das has replaced him. India 2-0 Kenya. India 2-0 Kenya. This time it is Jeje Lalpekhlua who scores with a brutal pile driver. The stadium is going berserk. The match is surely in India's hands now. Sunil Chhetri is brought down in the box, the referee spots to the spot. India have a spot-kick to fo ahead. Chhetri shoots towards the right side, goalkeeper Patrick Matasi gets a hand but it has too much power and the ball goes in. Sunil Chhetri scores! More than an hour has been played and the game is much more vibrant in the second half. While Kenya have had two chances, India are getting better with each passing moment. Halicharan Narzary is causing problems on the left flank while skipper Chhetri is making the important runs in the box. India's first real chance comes in the 55'th minute. A brilliant cross from the left flank by Halicharan Narzary finds Sunil Chhetri in the box. But the talismanic Indian striker fails to contact and scuffs it out. This is the best chance for Kenya so far. A smart pass opens up India's defence, huge gap between 2 defenders as Oevlla aims for the goal but shoots it just wide. India's defence is too high at the moment and they need to wary of the counter-attack and the long-balls. The Sri Lankan referee blows the whistle and we are underway. Hopefully, we will have a better 45 mins in comparison the first. Kenya's tactics so far have been to go long. India needs to string together a few passes and then hope for a better attacking move. One good news- the rain has reduced to a drizzle! Meanwhile, Kenya's assistant coach has been sent off! Udanta Singh once again comes to close to opening the scoreline with a fantastic dribble and nutmeg but is ultimately stopped before he can go for the glory shot. 1 minute is added on but there is no change in the scoreline. At halftime, it is 0-0. Life has been difficult for both the teams. But it is the Kenyan side which has looked good with a better plan and by adjusting well to conditions. They look most likely to score. India's only chance came in the 21st min with Chhetri. Apart from this, it is been quite a lacklustre affair so far. Anirudh Thapa, Udanta Singh come close! The Indian team is trying hard to conjure up a move. Anirudh Thapa and Udanta Singh create a good bit of play towards the right flank but just as they try to get the ball in it gets cleared once again. This has been the story so far. Half an hour into the match and India have a better con possession rate at 53 percent. However, both sides haven't seen a real opening. The relentless rain has only added to the problems. India's direct football is a good option but they must play the ball beyond the defensive line if the forwards have to make an impact. India almost came close to scoring. The puddles near the front of Kenya's box saw the ball sit up. Goalkeeper Matasi is caught off his line as Sunil Chhetri tries to lob the ball over the keepers head but the ball sails just above the post. A freekick from the right side by Udanta Singh but the Kenyan goalkeeper with the cap latches on to the ball and keep his goal safe. Meanwhile, Pronay Haldar gets hold off the ball near the box but fails to convert the chance. Nervous start by both the teams. However, Kenya has been able to get through a couple of incisive passes and find a couple of corners. However, the net result has been zero shots on target. India, on the other hand, are yet to have a shot on target. Anirudh Thapa makes the run from the midfield and passes the ball to Sunil Chhetri but the Indian skipper is caught off-side. Opportunities will not come easy against this Kenyan defense and India need to make it count. National anthems are done and we are underway. It's pouring in Mumbai and Kenya are on the offensive and are trying to push India back. The boys in blue need to make use of the wide spaces on both the flanks. Players are on the field! Before Sunil Chhetri donns India colours for the 100th time, the 33-year-old receives a guard of honour before he leads the team out to face Kenya at the Mumbai Football Arena. Chhetri is also the all-time highest goalscorer for India. Amit Mishra shows his support! Good evening and welcome to Indian Express’ live coverage of the Intercontinental Cup between India and Kenya. 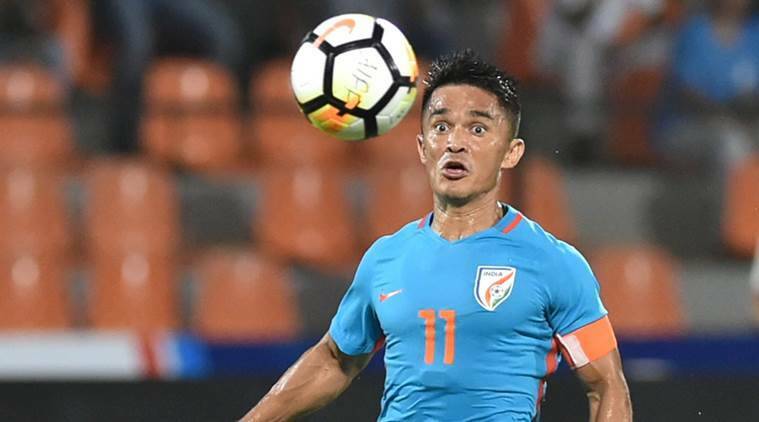 India skipper Sunil Chhetri will be making his 100th International appearance when the home team square off against the African nationa in the second match of the tournament. A passionate appeal on social media has resulted in tickets being sold out for the encounter and a full house is expected. Stay tuned for all the live updates as we build up to the much-anticipated clash. Sunil Chhetri will be appearing for the 100th International match when India face Kenya in the second Intercontinental Cup match on Monday. Chhetri is also the all-time highest goalscorer for the country and the only Indian to have scored more than 50 international goals. The 33-year-old scored a hat-trick in his 99th international match which ended with India thrashing Chinese Taipei 5-0. Chhetri has played an integral role in India’s recent rise in FIFA rankings under Stephen Constantine. His recent video on social media appealing people to come to the stadium watch the Indian team play has gone viral, resulting in the stadium being sold out.